Before I became a strategist back in 2009, I had spent more years than I care to remember working as an oil sector analyst, required to supply a continuous narrative on developments in petroleum markets. So the events of recent weeks, which have seen crude prices in free-fall, haven’t put me under the kind of pressure that I became accustomed to whenever the oil markets took a dramatic turn for the better or the worse. Even so, I feel a need to provide some analysis here, not least because I have read so much nonsense on the subject of late, particularly where medium- and longer-term prospects are concerned. It was ever thus – a sharp fall in prices inevitably triggers predictions of long-run disaster for the industry, just as surely as a spike provokes dire warnings of sustained disaster for everybody else. Let me cut to the chase. The recent crash in crude prices is eminently rational, and should indeed have happened quite a long time ago. No political sub-text is required to explain this slump, which is not to say that there are no such sub-texts as, pretty clearly, there are. Second, things are likely to get worse – a lot worse – before they get better, and markets are likely to be far more glutted with oil by March than they are now. Third, though, what we are witnessing is not the dawn of an age of cheap energy. To understand why the slump in oil prices was not just inevitable but long overdue, take a look at the table below, which is based on OPEC data and is expressed in millions of barrels per day (mmb/d). 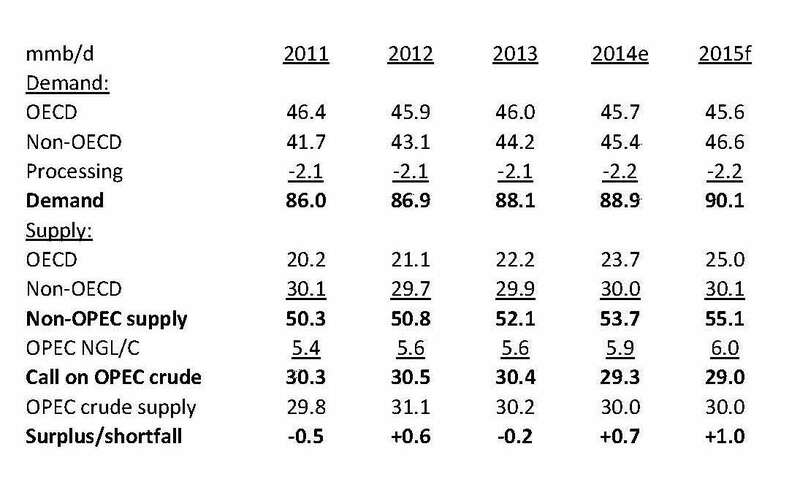 Comparing 2014 with 2011, demand for oil has increased by 2.9 mmb/d, a number exceeded by the combined total of non-OPEC production (+3.4mmb/d) and non-conventional output from OPEC countries (+0.5 mmb/d). The overall effect has been to squeeze the market’s need for OPEC crude downwards by about 1.0 mmb/d, from 30.3 mmb/d in 2011 to around 29.3 mmb/d this year. Moreover, this number could worsen further next year, under the combined impact of economic weakness and further increases in non-OPEC supply. Since much of what is shown in 2014 – and, specifically, the probably oversupply of close to 1 mmb/d – was eminently predictable, the only real surprise about the recent slump in oil prices is that it didn’t happen earlier. If you understand how oil markets work, you can only anticipate further pressure over the coming three months. Essentially, there are two peaks in oil demand – the winter heating season, and the summer motoring (and flying) peak. These are at their most pronounced in January and August, respectively. These are the periods of peak demand for refined products. The peaks in the purchasing of crude oil, however, anticipate these consumer peaks, because oil has to be shipped, refined and distributed before it reaches the customer. Thus, any crude purchased after November isn’t going to reach the end-user until after the winter peak, which is why crude purchasing reaches its high-point in November. 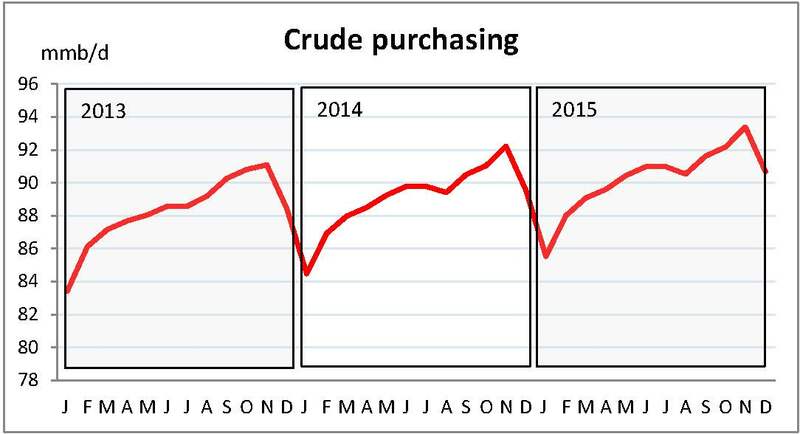 Thereafter, crude purchasing diminishes until it begins its run-up to the second (June) peak. Of course, OPEC is always able, theoretically anyway, to shore up prices by reducing its production, something that on this occasion the cartel, guided by Saudi, has been conspicuously unwilling to do. Some have tried to impute political meaning to this reluctance. Is the intention to bankrupt Iran, or Russia, or maybe both? This seems somewhat unlikely. Low oil prices will indeed inflict severe damage on the Russian economy, but, and as the forex markets have been telling us for months, Russia was already well on the way to economic catastrophe even without an oil price crash. As for Iran, the suffering inflicted by low oil prices will be severe, but it is by no means obvious that this will have a particularly acute impact on the policies of the Iranian government. Rather, the unwillingness of OPEC (meaning, in effect, Saudi and its closest allies) to cut production results from two, essentially economic calculations. First, Saudi sees no reason why it should cut its export volumes and revenues to benefit its competitors. Second, Saudi has probably calculated that a period of severely depressed prices can deal a mortal blow at competing producers, principally in the unconventional sectors of shale oil and tar sands production. And this, of course, brings us to what used to be called “the sixty-four thousand dollar question” – what is the outlook for shale oil production? This is clearly critical because, within the 3.4 mmb/d increase in non-OPEC production since 2011, no less than 2.8 mmb/d is attributable to increased shale oil output in the US. According to the Energy Information Administration (EIA), shale output is scheduled to increase significantly further between 2014 (4.07 mmb/d) and 2021 (4.80 mmb/d) before entering a very gentle decline. With demand growth likely to be sluggish, this is clearly an unappetising prospect for Saudi, and one that they would dearly like to stop in its tracks. Fans of shales seem to believe that low oil prices are unlikely to inflict significant damage to production, arguing (amongst other things) that improving technologies will drive costs downwards. Others, including me, believe that shale production is going to peak a lot sooner than the EIA believes, and that the subsequent decline will be very much sharper. I am on record as believing that the economics of shales are far from robust, mainly because output from each well deteriorates very rapidly indeed, declining by 60%, or even more, within the first year of production. This being so, the only explanation for the continued increase in shale oil output lies in an extraordinary rate of drilling, which has enabled output from new wells to more than offset declines from existing sources, but has also inflicted negative cash flows on the industry, even with oil prices in excess of $100/b. This is the “drilling treadmill”, which forces producers to keep drilling in order to stave off a slump in production. If I’m right about the drilling treadmill, US shale oil production was already poised to enter a precipitate decline from 2018-19. This suggests that OPEC’s unwillingness to shore up oil prices could bring that downturn significantly nearer, not by causing the shut-in of existing wells but, rather, by blocking the flow of funds that keeps the drilling treadmill turning. We should have a pretty clear idea about the outlook for shales within a year from now. Meanwhile, there is one factor that we should not lose sight of, and that is the cost-mix of the global oil production portfolio. That cost-mix continues to rise, and is the best long-run indicator of the outlook for prices. Output from big, low-cost fields continues to decline, and the cost of replacement production continues to increase. The marginal cost of replacement barrels is now far higher than the market price of crude oil, which can have only one implication on any long- or even medium-term assessment of the outlook. #41. The prettiest horse in the knackers’ yard? For good or ill, today marked the chancellor’s last chance to set out the economic and fiscal outlook, as it sees it, before everyone gets mired in the pre-election scrum. Essentially, and from a political perspective, Mr Osborne wanted to leave voters with two main messages. The first of these was that both the economy and the public finances are improving. The second is that things would have been much worse under Labour and, by more than simply implication, would deteriorate were Labour returned to office. Let’s deal with the latter point first, on which the chancellor is surely right. In a recent speech, opposition leader Ed Milliband completely forgot to mention the deficit, but I did not feel deprived of information as a result, since I have no idea what, if anything, Labour’s economic position amounts to. In the early days of this administration, Ed Balls accused the coalition of cutting too far and too fast. The obvious inference was that he would have cut less deeply, and more slowly. Fair enough, and he is (or perhaps I should say ‘was’) by no means alone in his mistaken belief that Keynesianism could resolve our current predicament. Now, though, he castigates the government for failing to hit its deficit targets, which surely means that he would have cut deeper, or would have increased taxes by even more. For the record, and at constant 2013-14 values, Mr Osborne has increased taxes by £78bn and cut overall expenditure by just £11bn (though the latter includes departmental cuts of £42bn, offset by increases in debt interest and welfare costs). Would Labour, to some extent a hostage to public sector unions, really have cut spending by more than Mr Osborne? Would they even have implemented the same freeze on public sector pay? I’m sorry, Ed and Ed, but I’m simply not convinced. It’s a fair bet that debt would have been even higher than it is now, had the heirs to Gordon still been steering the ship. As an aside, let me explain why a Keynesian solution wouldn’t work. If demand is weak (in what is known as a “de-stocking recession”), government can indeed stimulate the economy by injecting borrowed money. But this was (and is) a totally different kind of slump, technically a “de-leveraging recession”. It was caused by excessive debt. So, if the government were to put money into the economy, the private sector would have used it simply to pay down its own debt – private debt would have been transferred to the state, then, but demand would not have been stimulated. In any case, this government hasn’t exactly been un-Keynesian. Far from reducing debt, it has increased it enormously, since public debt is expected to have risen to £1,489bn by next April, in nominal terms a near-doubling from £760bn in April 2010. Rather, this administration has simply slowed the rate at which we add to the debt pile each year. Adjusted to current values, Mr Osborne will have added £670bn to national debt over five years. That’s equivalent to an annual average stimulus of just over 8% of GDP. This, of course, is where the first of Mr Osborne’s two claims breaks down. It is simply not true that either the economy or the fiscal situation is positive. This year, for instance, the economy is likely to grow by £80bn, but government alone will borrow more than that, to which should be added the big sums borrowed by households, most of it channelled through mortgage debt as our over-valued housing market continues to defy gravity. And this, I’m afraid, is “same old, same old” – borrow money, spend it, and claim that your income (the economy) has risen. Now, given that debt (both state and household) has soared, you might wonder why the bond markets haven’t punished us with higher rates (yet, anyway). There are two reasons for this. Firstly, there has been a global inflation of asset markets through QE, which has depressed interest rates world-wide. Second, Britain looks like “the prettiest horse in the knacker’s yard” – “our economy may look tatty, but just look at some of the others!” If you wanted to move money out of Britain, where would you put it? China, where the debt mountain is very probably even bigger? A Europe forced into brutal internal devaluation through the idiocy of the one-currency, multiple-budgets system? Japan, which has adopted a policy of economic suicide? Russia, which the forex markets tell us is back in the disaster territory of 1998? Or even America, where bond markets remain in vertigo-land thanks to huge QE? The real measure of our economic position is how much debt we have accumulated, relative to how much growth we have enjoyed. Do this sum, add in our huge current account deficit as well, and you’ll soon see that we are continuing to live on tick. That most other countries are doing the same, or worse, is a comfort, but only a relative one. As Mr Cameron has so rightly said, there are “red lights” flashing on the global economic dashboard. At home, the housing market could crunch if the Emperor’s new clothes (the ratio of house prices to disposable incomes) were ever to be noticed, or if interest rates were forced up by a global recognition that asset markets have been inflated artificially. Britain is not, then, in a good place economically (and I’ve made no secret of my view about some of the things that ought to be done). Fiscally, our spending remains far too high, though let’s give credit to Mr Osborne for the first real cuts in spending since the IMF held Jim Callaghan’s feet to the fire in the 1970s. This said, the only point that the chancellor really wants voters to take away from his statement is that things would have been worse under Labour. And he’s certainly right about that. This week’s Autumn Statement represents the government’s last real chance to put down some economic and fiscal markers ahead of the election, and what I’m going to do here is to set out a context. The Prime Minister has already paved the way, “getting his excuses in first” (as some commentators have put it, rather unkindly) by highlighting the “red lights” blinking on the global economic dashboard. My conclusions are that the recovery in the economy is misleading, in two respects. First, we are continuing to borrow a lot more than £1 for each £1 of growth. Second, growth is based on an expansion in jobs, but these jobs are so poorly paid that no net contribution is being made to the Treasury. Reflecting weak revenues, the deficit is likely to rise from £96bn last year to around £100bn, instead of falling to the £84bn projected officially at the time of the budget. Frankly, it is a relief to get back to economics after recent political events. The Rochester by-election was encouraging, at least in the sense that it gave each of the established, corporatist parties a poke in the eye, but it was overshadowed by the resignation of a Labour shadow minister over “white van” images. This incident spelled out the absurd contradictions at the heart of British politics. “Ordinary” people must not be patronised. You must not call them “pleb” or “white van man”. Feel free to load them to the gunwales with debt, to allow employers to pay them less than the bare minimum for survival, to permit “zero hours” contracts, to allow them to die unnecessarily in Stafford, or be abused on an industrial scale in Rotherham, yes. But please be polite about it. Even in an age of spin over substance, could anything be more cynically hypocritical? – The economy is growing, but growth is exceeded by incremental borrowing. – Job creation has been strong, but wages are far too low. – Public spending has been cut, but not by very much, the deficit remains far ahead of targets that have already been revised year after year, and debt is a lot higher than expected. – The government’s record has been mixed, but things would have been very much worse under Labour. Starting with the economy, growth is likely to be around 3% in the current (2014-15) fiscal year. Add back the GDP deflator and purely nominal economic output, not adjusted for inflation, is likely to have risen by around £80bn. That seems pretty good, until you realise that the government alone is likely to have borrowed about £100bn. Add in borrowings by households and we are still playing the same dangerous shell-game of achieving “growth” by channelling borrowing into consumption. According to official plans, public spending is supposed to come in at around £732bn this year, up £16bn from 2013-14. If this were achieved, total spending (at constant 2013-14 values) would be £718bn, modestly (£11bn, or 2%) lower than the £729bn spent in Labour’s last year (2009-10). Though this overall cut seems small, we need to recognise that the cost of servicing the government’s soaring debt pile has risen by £19bn over the same period, so primary (pre-interest) spending has declined by £29bn (4%) under this government. Within this pre-interest total, and despite stalwart efforts by the Treasury, welfare costs have continued to rise, so departmental expenditures at constant values declined by 8%, to £473bn in 2013-14 from £515bn in 2009-10. Since both health and overseas development have been ring-fenced, other departments have experienced double-digit cuts, yet overall spending reductions have been pretty modest. Revenue, meanwhile, was projected to rise to a nominal £648bn this year (including APF gains of £12bn), a real-terms increase of 2.7% over 2013-14 (though up 5% in nominal terms), and up 13.9% if compared with 2009-10. Expressed at constant 2013-14 values, then, official targets show revenue 14% higher, and spending only 2% lower, than in the last year of the previous government. This in turn means that critics’ accusations (that spending cuts have borne the brunt of fiscal rebalancing) are simply nonsense – this government has raised far more in taxes (£78bn) than it has cut from overall spending (£11bn). Had everything gone according to plan, the chancellor would have been able to project an underlying current-year deficit of about £84bn, lower than last year (£96bn) and, in real terms, barely half of the shortfall inherited from Labour. On a primary (ex-interest) basis, the coalition would have eliminated almost 80% of the inherited deficit. As recent figures have revealed, however, things have not been going according to plan in the first seven months of this fiscal year. Revenues, projected to grow by 5%, are only 1% higher, which means that income has actually shrunk in inflation-adjusted terms. Total spending, which has increased by 2%, is in line with forecasts, and essentially static in real terms. Even so, the deficit in the first seven months was £6bn higher (rather than, as expected, about £6bn lower) than in the year-earlier period. On this basis, government could be stuck with a significant overshoot, with the full-year deficit climbing to perhaps £100bn. More worryingly, public debt has already risen by close to £110bn thus far in 2014-15, and may stand at £1.48 trillion (86% of GDP) by the end of March, a lot higher than the official projection of £1.35 trillion (77%). What, then, can we conclude ahead of the Autumn Statement? First, the deficit has fallen very materially, in real terms, under this government, though it has not declined by anything like the amount projected back in 2010. Second, the brunt of this deficit reduction has been borne by tax increases, not overall spending cuts, over the lifetime of this Parliament. Third, however, revenue growth has ceased, despite the upturn in GDP, mainly because the reduction in unemployment has been accomplished through the acceptance of poorly-paid jobs. At the same time, the cost of in-work benefits has risen, again because of the low-wage nature of the recovery. So what we are left with is a workforce which, whilst it has expanded, still needs government subsidies, and earns too little to increase its contribution to the government’s coffers. It’s a recovery, of a sort, but it is debt-based, and remains incapable of funding the amounts spent by the state. Under Labour, we learned that government spending could not be afforded in bad times. Now, we are learning that it cannot be afforded in better times either. The “austerity” that we’ve experienced so far may be dwarfed by the austerity still to come.